Having spent two decades of my life in Bengaluru I'd not seen the historic spots except for Gavi Gangadareshwara Gudi and a cave temple near Bannerghatta. 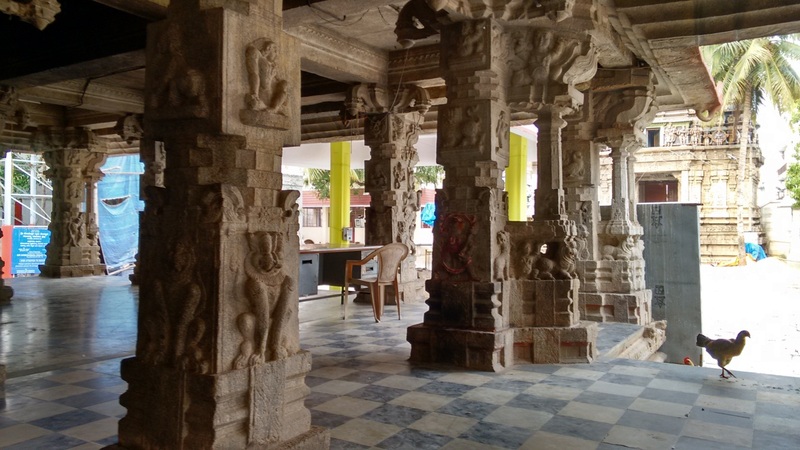 During this trip to Bengaluru, I planned a cycling tour of Cantonment areas to check out the churches established & built during British rule. 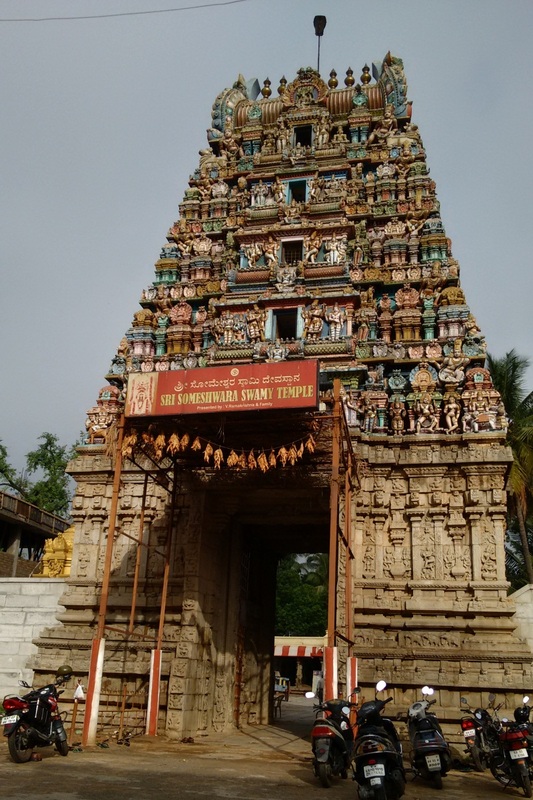 While riding from Trinity Church to Saint Lourdes Church I took a detour into the narrow lanes of Halasuru and went towards the ancient temple dedicated to Lord Someswara. The temple's gateway has a typical South Indian tower.. Gopura. 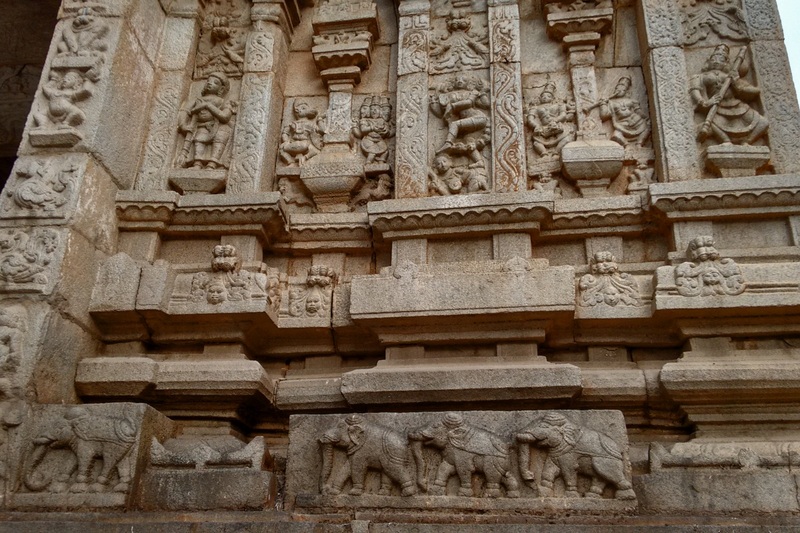 One look at the Gopura's base, I knew it was Vijayanagara architecture. 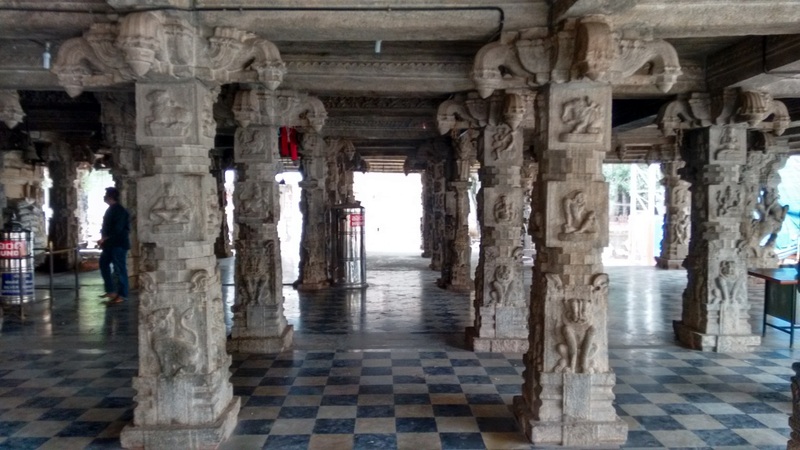 I just took a picture of the Gopura and continued my tour of churches. I returned another evening and spent an hour checking out the sculptures in detail. 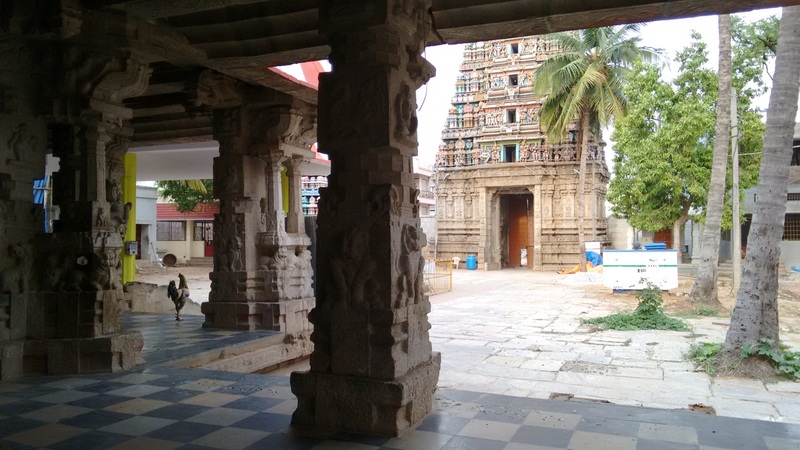 An online source says that this temple was originally built by King Jayappa Gowda (1420-1450 CE) of Yelahanka Nada Prabhu dynasty. The story goes like this.. while resting under a tree during a hunting trip in a forest near the present day Halasuru area, a man appeared in his dream and told him to retrieve a Shiva Linga and some treasure buried under the spot he was sleeping on. 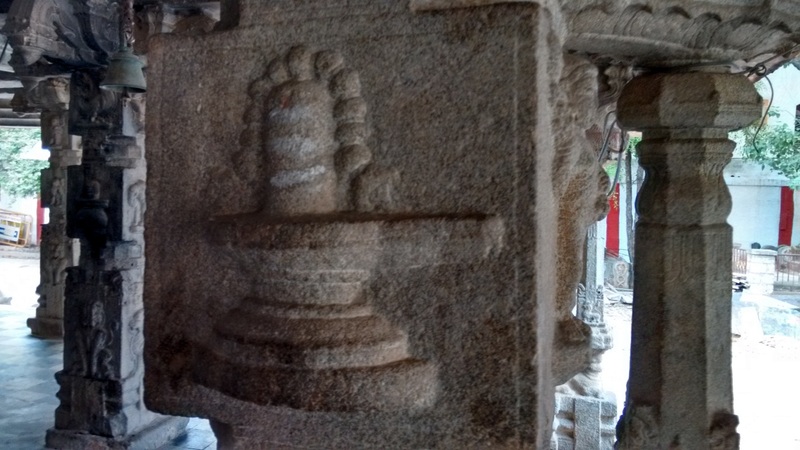 Having found the Shiva Linga and treasure, Jayappa Gowda built a wooden temple. According to another story the temple was built by a Chola king which later was renovated by a kingdom of Yelahanka Nada Prabhu dynasty. Well, whatever the stories say Someswara temple was definitely renovated by Vijayanagara kings. 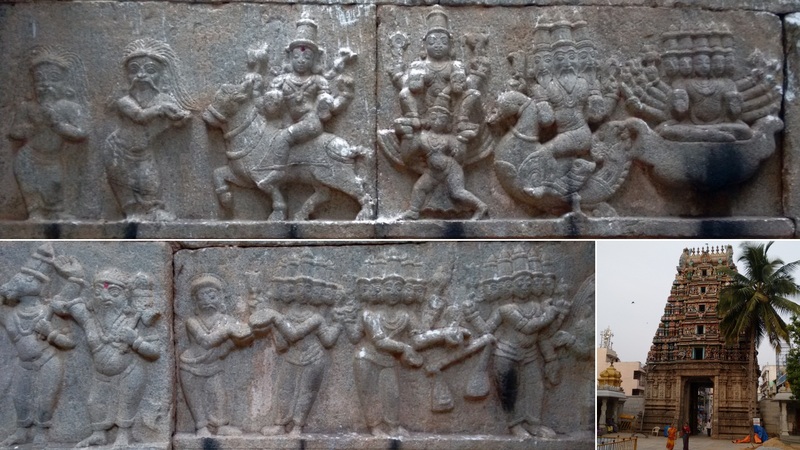 The presence of other temples of similar architecture in neighbouring districts like Tumkur, Kolar and Chikkaballapur is an indication of large scale temple renovation program carried out by Vijayanagara rulers. 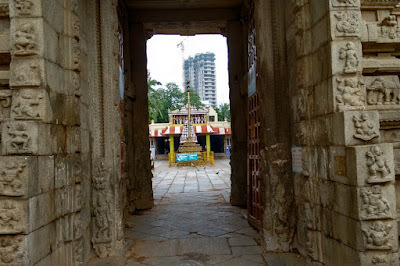 This is the massive doorway under the towering Goprura. 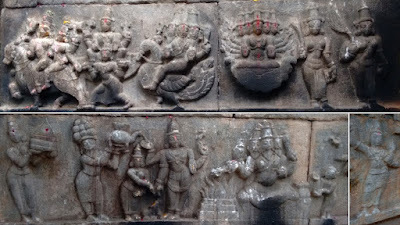 Dressed granite blocks decorated with murals of Sun, Moon, Gods & Goddesses, anthropomorphic figures, animals, plants and imaginative creatures. 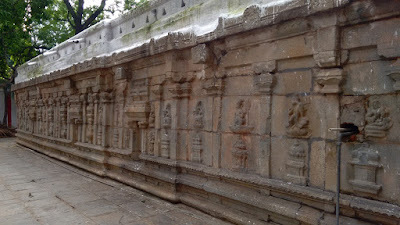 The right hand side wall of the Gopura. 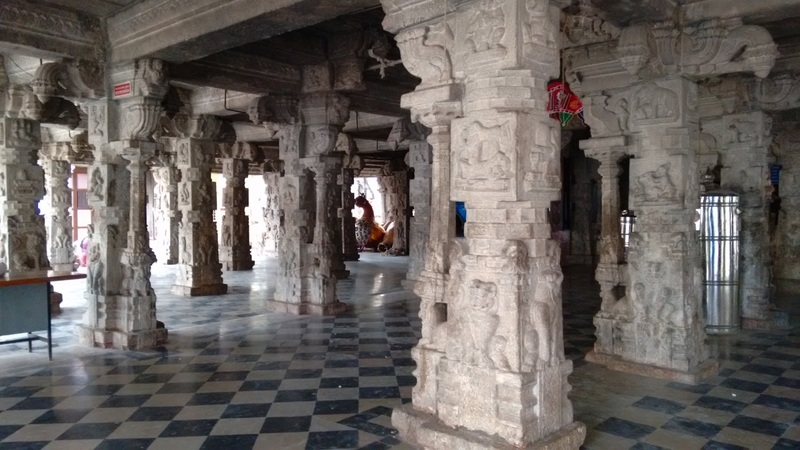 The temple has a large Sabha Mantapa.. an open hall built on a platform, its roof supported by some 60+ richly decorated pillars. 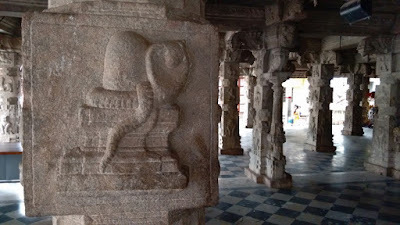 The stairway is flanked by a pair of tuskers with stretched out trunks. This temple is a Ekatachala meaning with one sanctum. Pillars on the perimeter are same as the one inside. They seem to be musical pillars.. just the like the ones at Vittala temple of Hampi. 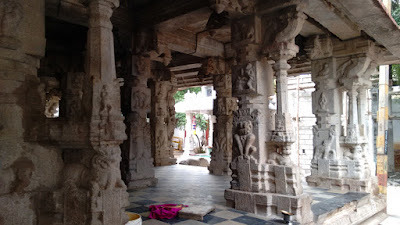 Every pillar has three square sections with dodecagonal connecting sections. 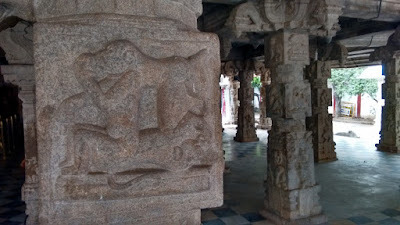 The pillar top has four-sided-floral hangings. Like most Shiva temples, Someswara temple is also an east-facing temple. 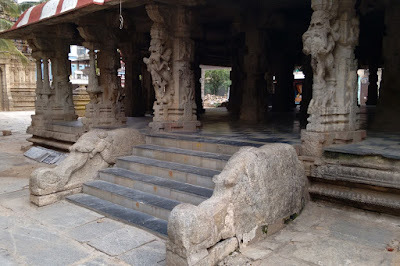 Besides the front stairway the Sabha Mantapa has two side stairways. 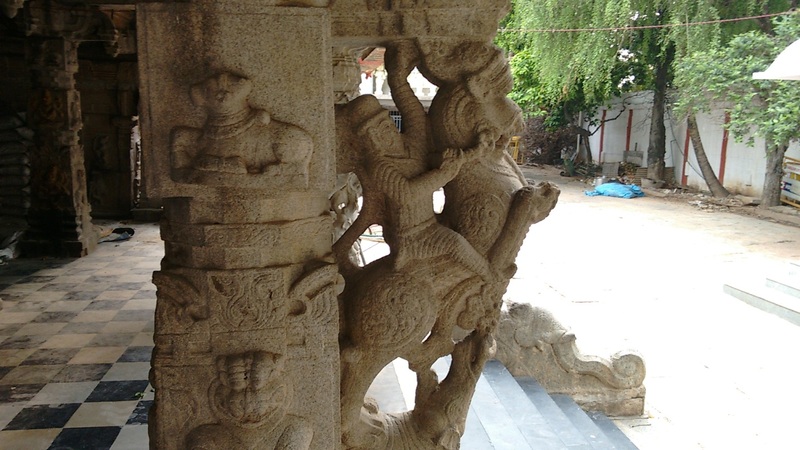 This pillars flanking the side entrance are special, a warriors astride leaping lions. The path between these two rows leads to Garbhagudi the sanctum. 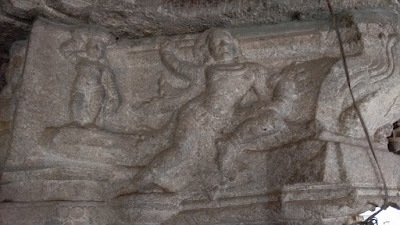 One of the pillar tops features a woman. Here you can see four monkeys but only two heads and two tails. A shiva Linga with Rodrakshi Mala. 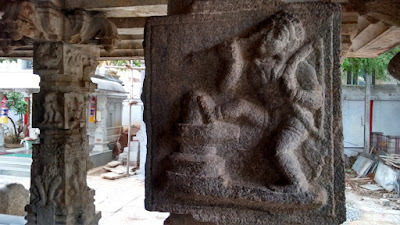 Bedara Kanappa gouging his eye out for his Lord. 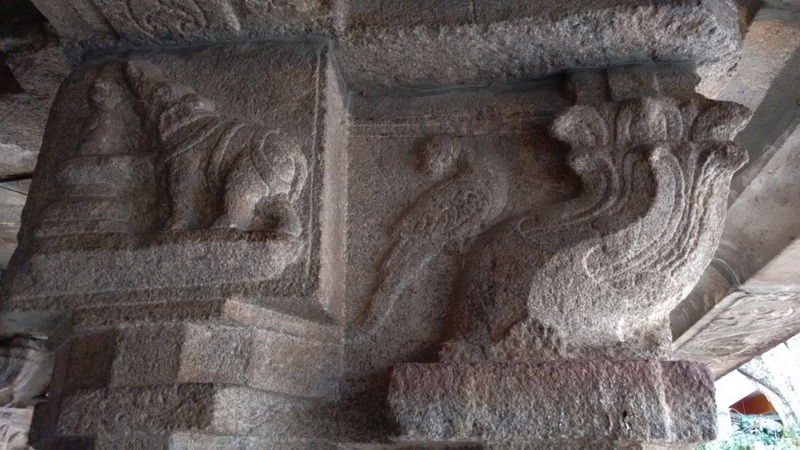 Elephant bathing Shiva Linga by spraying water from its trunk. 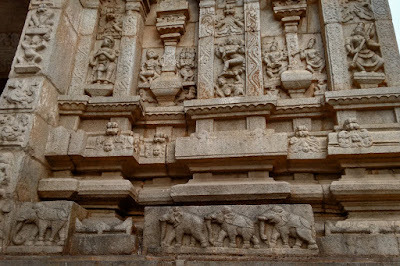 The south and north walls are similar with equally spaced figures of various legendary characters. Vases and models of towers. 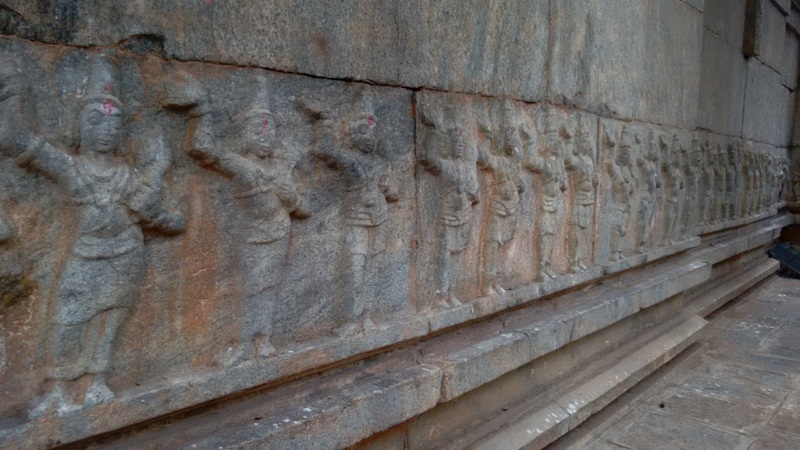 There are many bearded characters on these walls. 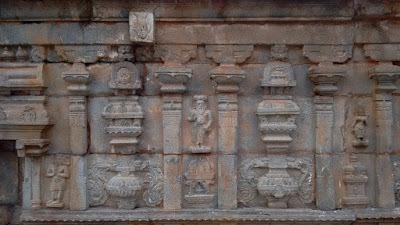 On the rear wall of the temple are images of Girija Kalyana.. wedding of Shiva-Parvati. You can see images of 3 lords of our world on their Vahanas. Brahma on Hamsa, Vishnu on Garuda and Shiva on Basavanna. A row of male figures with their right hands raised. 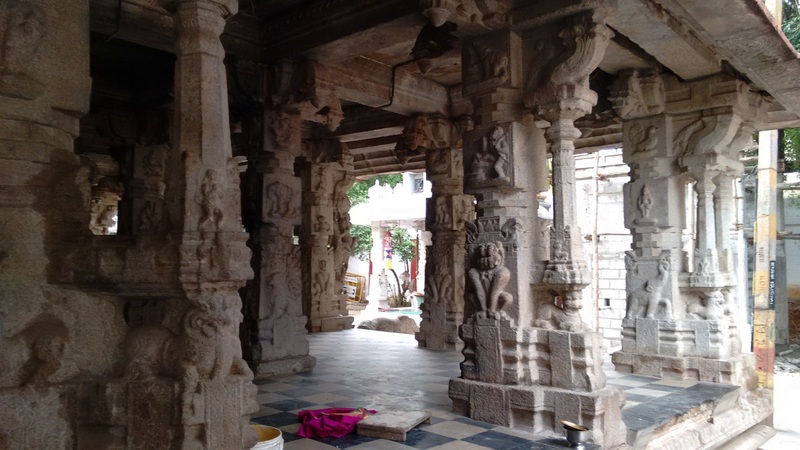 This ancient temple is maintained but is some more care is required.